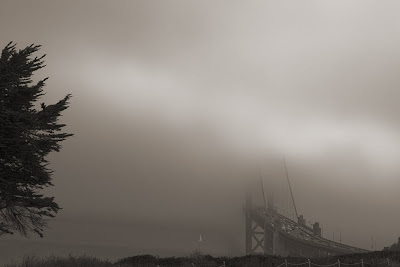 The fog moved slowly westward with patches of sunlight exposing the Golden Gate Bridge. In this image vehicles disappear into nothingness and the fearsome prospect of a nosedive into the straights below. i love this...title and description is so perfect!!! Thanks for the praise. May I ask how you found my blog?